Once again, Paradox have put out more content both paid and free for Stellaris and my love of the game continues on rather strong. Note: DLC key provided for me. I noted a few times in the past, how I really enjoyed Stellaris but it did often have a somewhat empty feeling to it at times. A few patches and an expansion later it’s a very different game. One I’ve poured a great many hours into and shall continue to do so. Honestly, all the changes together have overwhelmed me somewhat and I'm still going through a lot of it. I want to be clear though, this is not a negative mark for it at all. Just that there's so much that has changed, that you have to re-learn and adjust the way you play it. 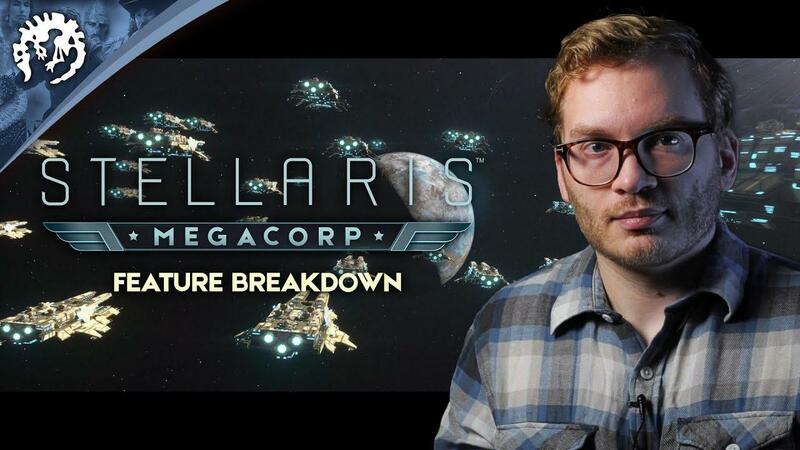 If you thought you knew Stellaris—think again. I've massively enjoyed it, playing through the night before it even hit me what time it was and again the next day, that's just how engrossing it is. A shot of the new planetary screen, with the new districts and buildings systems. The MegaCorp expansion certainly does mix up how your games can play out. Especially true if you actually play as a Megacorporation empire type of course. Not just that though, there's the new civics, new ascension perks, space traders, new Megastructures and so on. The key thing with the MegaCorp expansion, is that outside of the new mechanics, the basic gameplay does remain mostly the same yet it gently nudges you in different directions. If you've previously played the game as a mighty empire looking for a fight or a diplomatic federation of races, perhaps becoming an economic powerhouse might be an interesting change of pace of you. Unlike other expansions, I think MegaCorp is tailored more towards veteran players. Funnily enough though, given all the changes here I actually found it a lot easier to build up a big reserve of resources, while also building the biggest fleet of ships I've ever been able to. 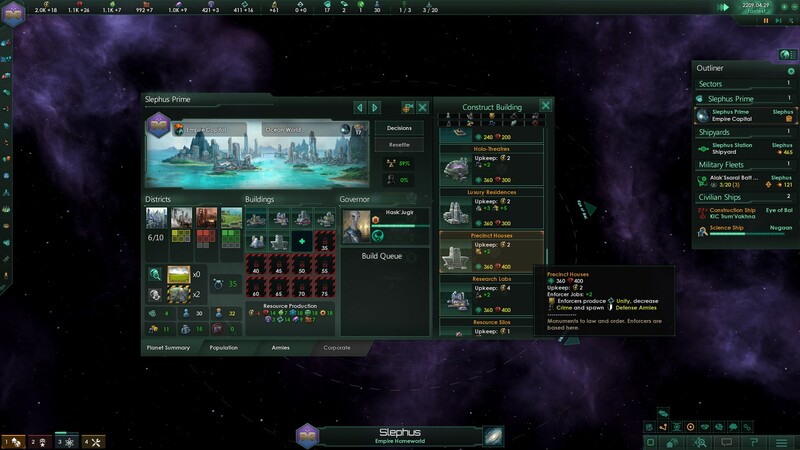 The new systems in place for managing planets and resource generation might seem intimidating at the start, but it actually makes quite a lot of sense and it is a vast improvement over the incredibly basic tile system Stellaris had originally. It has more depth, while remaining accessible which I think is still a good selling point for Stellaris. It's not just the new planetary systems that enable you to make greater use of your population for resource output, it's also the new market systems that also help greatly here. If you find your civilisation has an abundance of a particular resource, buying and selling on the market to get rid of what you don't need in favour of what you do can really easily push you forwards. 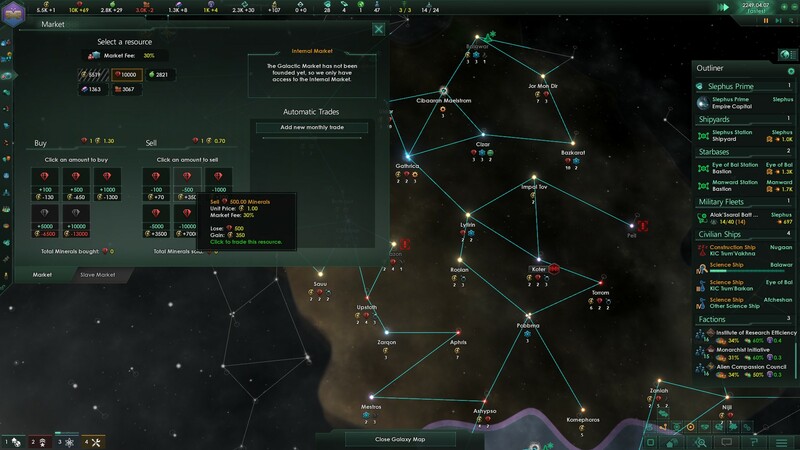 It doesn't make it too easily though, as with Stellaris the random nature of it can suddenly see you requiring a lot of a resource you previously didn't. So, simply selling tons of what you don't need right at that moment isn't necessarily the best idea for the long-term prosperity of your race. I often see complaints about how the game changes a lot and how the DLC makes it feel “incomplete”, however, I’ve never felt like that with it at all. Even without any DLC, the game has a lot on offer (especially when compared to the original release). As for how it changes, I see it as a strength for it to remain fresh to keep me interested. Considering how long games of Stellaris can take, having it refreshed every few months is ideal. Paradox have a really great game here, I hope they continue supporting it for many years to come. Few developers support their games as long as they do, it’s great to see it supported on Linux and continue to expand. MegaCorp and the 2.2 patch together are fantastic, although honestly the free patch by itself is so different it outshines the DLC a fair bit. It makes space thoroughly fresh, dynamic and exciting again and allows you to play the game in a different way. You can see a full readout of what’s new in both here on the Paradox forum. If you haven't played for a while, Paradox recommend going through the updated tutorial. As expected, Paradox had Linux support for the patch and DLC ready for pre-release testing and it's been running very well. Find Stellaris and MegaCorp on Humble Store, GOG and Steam. You can also find the release trailer here for MegaCorp, but the above overview trailer does a better job. Cool. I love the way Paradox aren't afraid to make major changes to gameplay after release. But (heh, paradoxically) this is also the trouble with owning too many Paradox games. You're just getting into one of them when they release a big update on another and you have to check it out. Someone gave me Surviving Mars the other day as an early Christmas present (way better than expected, by the way; I think my reservations about replay value may be unfounded, especially with the DLC), and now I'll probably fire up Stellaris to see the new stuff and forget all about it. Still, it's a good problem to have, right? This looks very cool to me. The Le Guin looks great . . . but I'm thinking very seriously about grabbing this DLC at full price, which I do try to avoid. You can just select on older version from the Betas tab and play that if you want to avoid learning the new mechanics. That's one of the beauties of Paradox games -- you can just revert. I've personally been waiting for this patch for a very long time. In my opinion this is a major quality improvement and I actually enjoy exploring the new possibilities this upgrade provides. Hurrah! I've been waiting for this to release before I started a new game. Can't have it all. Plus, I have yet to see a Stellaris version that was broken to the point of being unenjoyable, so playing a previous version is not exactly an impossible feat. I think you are just being difficult. I am not the only one who thinks that gameplay should be done correctly the first time, not literally changing everything after release. 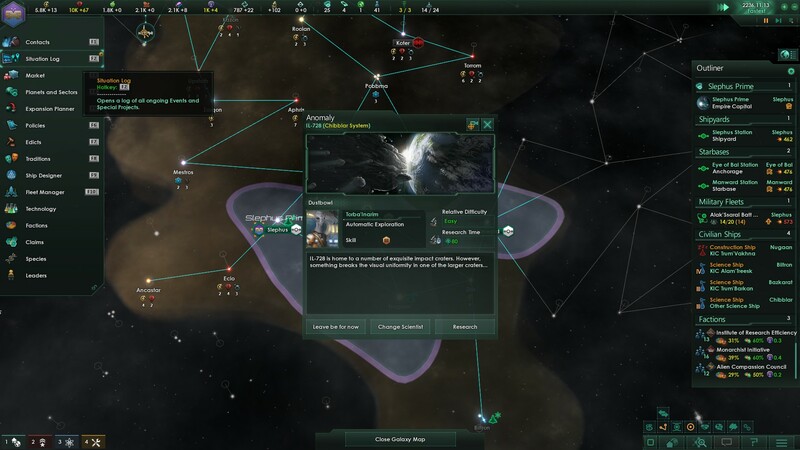 Install 1.0 of Stellaris and tell me it has any resemblance to the 2.2 version, at all... So what happened, was it an early access game that was prone to change, sold as a full price product? Why should we accept this behavior? It is not that i am being difficult, it is YOU who are not more critical of this situation. I enjoyed Stellaris 1.0 when it came out and thought it was a good game. I think the new versions are even better and have enjoyed them even more than 1.0. So I can't really see the issue when a game I liked became an even better game over time. I mean, they probably could have gone and released Stellaris 2 for you and then you could have had your clear separation of versions and paid for the game twice. But I don't see why a game can't improve over its lifetime and has to be feature frozen because some people won't bother learning how the new mechanics work.